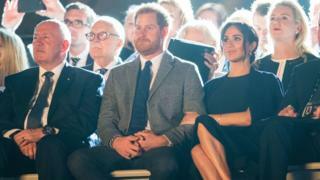 Prince Harry and Meghan are attending the opening ceremony of the Invictus Games at Sydney Opera House for injured service personnel. It comes a year after the Duke and Duchess of Sussex made their first official public appearance at the event – started by the prince in 2014. The start of the ceremony, the latest stop on the couple’s Australian tour, was delayed by thunderstorms. Earlier, they paid their respects to Australia and New Zealand’s war heroes. They were joined by the Australian Prime Minister Scott Morrison for the opening of a memorial which commemorates those who fell in World War I, as well as conflicts including Korea, Afghanistan and Iraq. Harry and Meghan then took in the first event of the Invictus Games – the Jaguar Land Rover Driving Challenge at the city’s Cockatoo Island. The duke presented medals to the winning teams, as well as testing his driving skills on the children’s remote control car course. The Invictus Games will see athletes from 18 countries compete in 11 sports over eight days. The duke, who served in the Army for 10 years, founded the Invictus Games in 2014 with the aim of helping wounded service personnel and veterans with their physical and psychological rehabilitation. That year the games were held in London, before heading to Florida in 2016 and Toronto last year. Twelve months on from their first official appearance together, the Duke and Duchess of Sussex have since got married and announced they are expecting a child in spring. UK lottery winners: What did they do with the money?